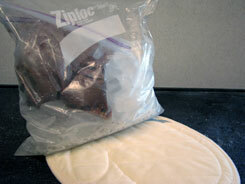 NOTE: Freezer bags work best because they are thicker and less likely to develop small holes. Fill 2 qt. 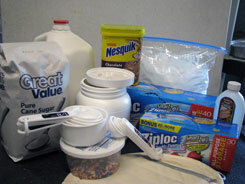 zip-lock bag with milk, sugar, and vanilla. Optional ingredients should be added at this time as well. Seal bag securely and set to the side. Add ice and rock salt to 1 gal. zip-lock bag. Place 2 qt. zip-lock bag inside the 1 gal. zip-lock bag. Seal bag securely. Shake the 1 gal. zip-lock bag for 10-15 minutes. The constant shaking motion will promote the freezing process. The more you shake the closer it will get to hard ice cream. The bag will become very cold to the touch. Consider using oven mitts or a kitchen towel to cover the bag while shaking. 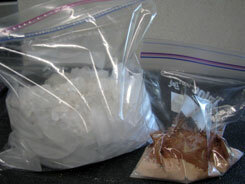 Just like we use salt on icy roads in the winter, salt mixed with ice causes the ice to melt. When salt comes into contact with ice, the freezing point of the ice is lowered. By lowering the temperature at which ice is frozen, we are able to create an environment in which the milk mixture can freeze. 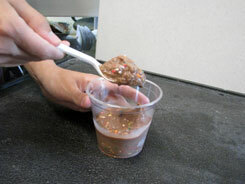 The fat particles in the milk smash into each other and make big molecules of ice cream!